Silicon signoff and verification encapsulates a set of tools that address a series of electrical and physical signoff and verification steps that designers must perform on their design before tapeout. These steps report errors that require iterative and incremental fixes, also called engineering change orders (ECOs), ensuring the design integrity from an electrical and physical standpoint. Our signoff tools, the Quantus™ Extraction Solution, Tempus™ Timing Signoff Solution, Voltus IC Power Integrity Solution, and Pegasus™ Verification System, are all cloud ready and have been built to run on massively parallel server farms. These server farms can reside internally within the company or externally at a cloud provider. Your design is automatically partitioned into smaller instances, is split up across multiple machines and CPUs, exploits multi-threading, then balances the load between machines and CPUs through adaptive scheduling. Several of our customers have been using these new tools and have seen performance speedup in the orders of magnitude. 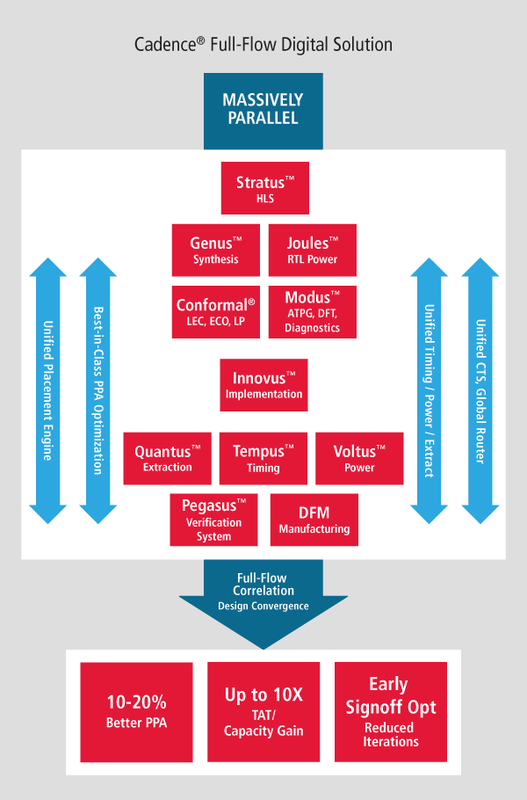 The Cadence® digital design flow now uses integrated engines for timing, placement, power, and extraction throughout its flow from the Genus™ Synthesis Solution all the way to silicon signoff with the Tempus and Quantus solutions, Pegasus system, Design for Manufacturability (DFM) solutions, and Voltus™ power solution. Referred to as “in-design verification”, this flow leverages signoff verification solutions to avoid any correlation and consistency issues that will penalize the designer during the final stage before tapeout. For instance, this means that when the Genus solution runs synthesis earlier in the design cycle, it uses the same placement and routing that the Innovus™ Implementation System would during the implementation, and can make better choices earlier in the design cycle where issues are easier to fix. And, in the Innovus system, designers can run the Tempus Timing and Voltus Power solutions, as examples, to close timing faster at tapeout. This causes far fewer iterations later in the design and much faster convergence during signoff. This in-design capability with integrated engines also eliminates, or greatly reduces, the need for designers to build in significant pessimism into their design budgets, greatly improving power, performance, and area (PPA) in the process. The integrated engines in our signoff tools have been designed to not only analyze problems early on in the design flow, but to also fix them as needed, resulting in far fewer back-and-forth iterations between implementation and signoff. Our tools can find the problems, analyze various scenarios, choose the best PPA optimization available, and implement them early in the design flow, resulting in designs that come within 2% to 5% of signoff metrics for PPA closer to tapeout. All of Cadence’s signoff tools or capabilities are integrated in the Virtuoso® platform, providing the same capabilities for mixed-signal and custom designs. Silicon signoff and verification is the crucial last step that gates signoff in every design flow. Using the Cadence design flow with our integrated engines and massively parallel tools will enable this process to be far smoother and will ensure faster design closure with much improved PPA.